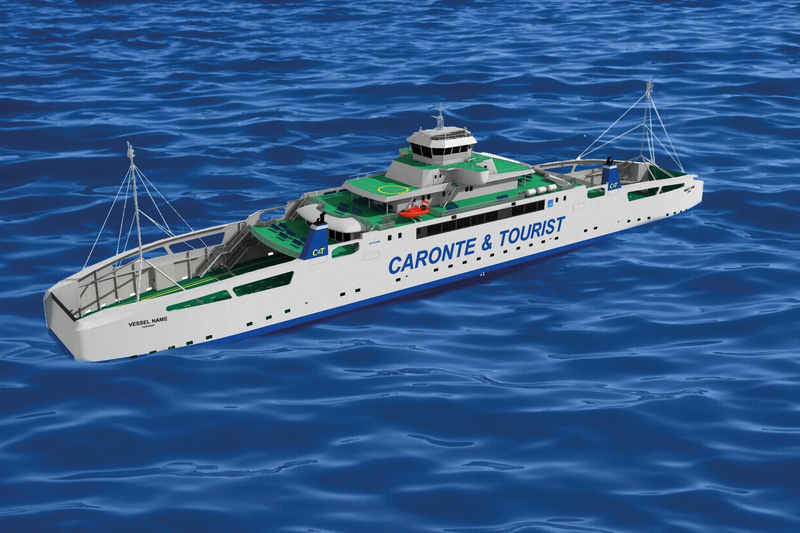 The basic and detailed engineering studies of the small Ro-pax prototype concerned a new LNG powered ferry of Caronte & Tourist Lines. More in details, the study covered the general specifications and basic and detailed design of a new dual-fuel LNG double-ended car and passenger ferry vessel. The double ended 7 decks ferry is designed to operate in EU Class D areas able to carry passengers (decks 4 and 5), private cars, trucks and trailers (decks 2 and 3) as well as dangerous goods including LNG ISO containers (aft area on deck 3). The main dimensions (LxBxT) of the ship are 133.6 x 21.5 x 4.7. The ship has a capacity of about 290 cars, 35 trailers and 1500 persons on board. Service and maximum speeds are respectively 12.5 and 15 knots. The LNG tank will have a capacity of about 150 cubic meter to enable to supply LNG as marine fuel as per vessel naval architecture capabilities and per fuel consumption needed demand. The ship is Italian flagged and RINA classed with Gas Fuelled notation (IGF compliant). Investigations included also all those new aspects that have to be adapted, improved and fine-tuned according to the use of LNG as fuel (such as skills and training needs, maintenance, control and monitoring systems, IT platforms & computerized management systems etc.). A typical risk analysis of the small Ro-pax ship bunkering operations in GAINN4MOS ports has been carried out, including appraisals on SIMOPS issues (simultaneous bunkering and passenger handling operations). Basic engineering studies also focused on the analysis of the proper LNG bunkering system for typical small Ro-pax ships in the Mediterranean. In the start-up period, until appropriate LNG fixed refuelling infrastructures are widely spread, considering the small needed amount of LNG, the typical transfer system, performed via mobile LNG infrastructure, might consist preferably of truck-to-ship operations via LNG tank truck/ISO containers or alternatively of ship-to-ship operations via small LNG bunkering barges/ships (that could act both as floating storages and as ship-to-ship transfer systems). After completing the engineering studies, a prototype of this small LNG Ro-pax ship is being built (newbuilding). This ship will be piloted in real life operations and jointly tested with the LNG refuelling facility from Italian ports prototyped in GAINN4CORE Action.